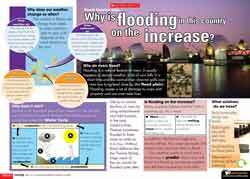 The poster text poses a series of questions about the issue of flooding in the UK, followed by some simple explanations of the elements involved. It demonstrates a range of organisational and stylistic features typical of the genre, and introduces some technical vocabulary. Discuss weather events in the headlines. Have any happened in the UK recently? Discuss the effects of flooding as reported in the news. Why do rivers flood? Assess what the children already know. Children should be familiar with the differences between narrative and non-narrative texts, and be able to identify some of the features of an explanation text. Exactly what I was looking for, a text with features analysis.